The US Fish & Wildlife Service estimates 30,000,000 to 60,000,000 bison lived in North America when Europeans began arriving on the north American continent. 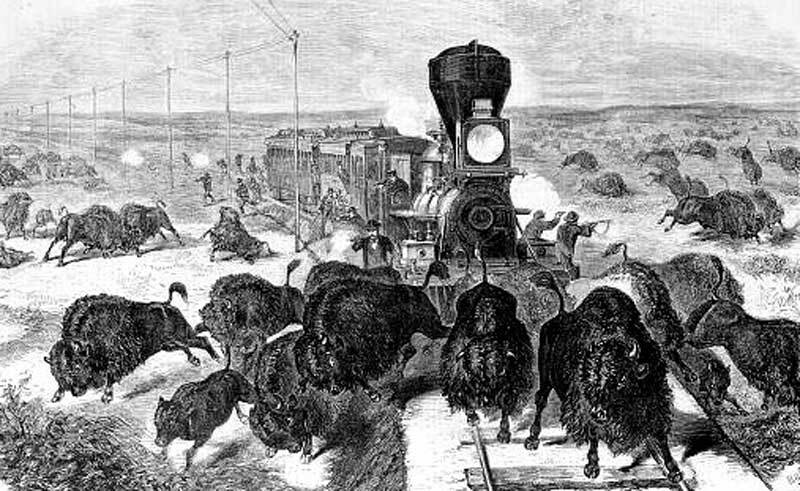 Due to massive (and arguably, mindless) slaughter by European settlers, by 1890 there were fewer than 1,000 buffalo in North America. According to the National Park Service, Bison were almost extirpated before 1900, leaving a remnant, indigenous herd of approximately 23 bison in the Pelican Valley of central Yellowstone. It is from those surviving few animals that today's Yellowstone herds, of only a few thousand animals altogether, are descended! 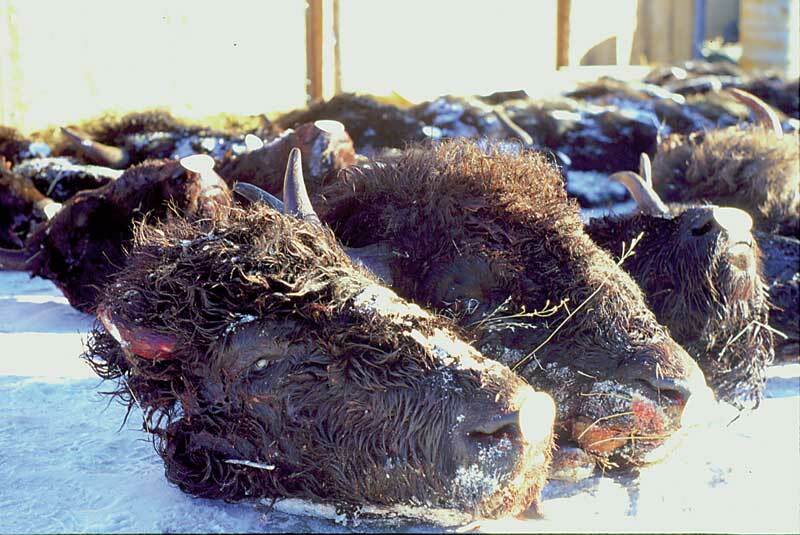 Tragically, more wild buffalo have been slaughtered in America since 1995 than in the entire preceding century. Think about that for a moment. Yes, there used to be tens of millions of them. Now we have only a few thousand...but we harass, relocate, and kill these walking national treasures for the profit of a few cattle ranchers—and at the expense of we taxpayers. 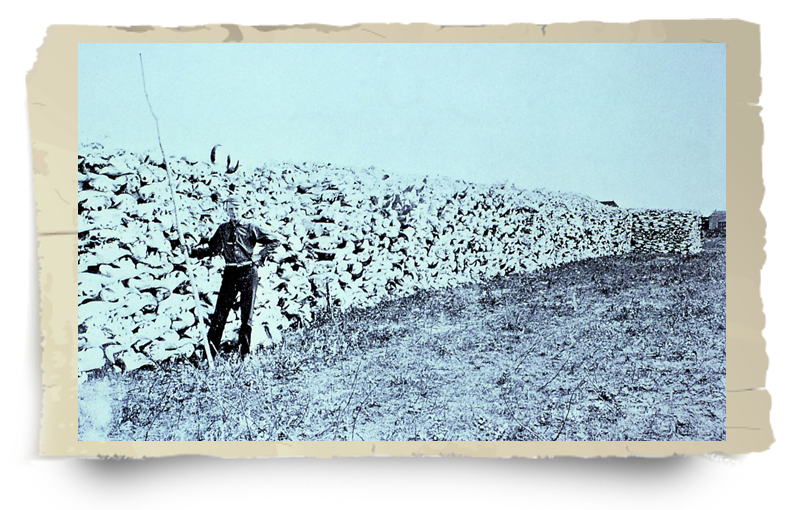 You’ve probably seen pictures like the one below, showing skulls and pelts stacked in unimaginable numbers. The result of that careless behavior is that none of us has ever heard the rumble of millions of hoofs beating through a valley in the summer sunshine...and no one will, as long as we allow business as usual." Wishing to control the land of the native people, and knowing the Indians’ complete dependence upon the buffalo, 19th century government leaders launched a campaign to wipe them out. In so doing, they forced the Indians into a sedentary lifestyle more in line with the prevailing European notions of private property and "civilization." "The civilization of the Indian is impossible while the buffalo remains upon the plains. I would not seriously regret the total disappearance of the buffalo from our western prairies, in its effect upon the Indians, regarding it as a means of hastening their sense of dependence upon the products of the soil and their own labors"
Not only did the European settlers of the new world view the survival of buffalo as a means of perpetuating the ways of Native American life, they saw the buffalo as being incompatible with their dream of a Great Plains cattle culture. It was a simple matter of competition; as long as buffalo remained wild, they would out-compete the cattle for grazing lands and stand as a living reminder to the uncivilized nature of a pre-settlement West. "There is no law that Congress can pass that will prevent the buffalo from disappearing before the march of civilization. There is no law which human hands can write, there is no law which a Congress of men can enact, that will stay the disappearance of these wild animals before civilization. They eat the grass. They trample upon the plains upon which our settlers desire to herd their cattle and their sheep. They range over the very pastures where the settlers keep their herds of cattle. They destroy the pasture. They are as uncivilized as the Indian." These attitudes remain strong even today. The influence of the cattle barons is heard loud and clear while most Native American voices fall on deaf ears. To the western livestock industry, cattle represent an economic interest and way of life, although barely a hundred years old. To Native Americans the buffalo represent the essence of their social, cultural, and spiritual identity; and a relationship that is tens of thousands of years old. Consider this: the fact that the tribes haven't been allowed serious participation in discussions where ranchers, land managers, and politicians decide the fate of the buffalo reflects both a lack of wisdom and the utter disrespect for a heritage and way of life that has existed for many tens of thousands of years—not 100. "Absent are the people who actually know the buffalo: the Nez Perce, Blackfeet and Crow, and others whose treaties encompass part of Yellowstone National Park, or the Winnebago, Ho Chunk, Lakota, Anishinabe, Kiowa, Gros Ventre, Cheyenne, Shoshone Bannock and others, whose spiritual practices, cultural practices, languages, and lives are entirely intertwined with buffalo. To us, the buffalo is the Western Doorkeeper, the Elder Brother, the Great One." Not only is the tribal voice being ignored, but as the actions of policy makers and Montana Law Enforcement Officers attest: the religion and culture of those who consider the buffalo sacred are being willfully violated. The actions of Montana's Department of Livestock are in the same vein as the actions of their predecessors—the buffalo hunters and Army officers who perpetrated the slaughter in the 1870s. According to Lakota leader Joseph Chasing Horse, "When the U.S. government slaughtered the buffalo as a way to subjugate Indian people, they put into motion an imbalance in the ecosystem that continues today." How true he spoke. On March 7, 1997, during a winter when 1,084 buffalo were killed, American Indian tribal leaders from around the country gathered near Gardiner, Montana, to hold a day of prayer for the buffalo. The ceremony was disrupted by the echo of gunshots. Lakota elder Rosalie Little Thunder left the prayer circle to investigate the shots. Less than two miles away, Department of Livestock agents had killed fourteen buffalo. Walking across a field to pray over the bodies, she was arrested and charged with criminal trespass. To Little Thunder and other tribal members present there was no question of coincidence: "They shot the buffalo because we were at that place on that day at that time," she said. This slaughter goes on every year, though it has various names: hazing, relocation, wildlife management, etc, it is really just the continuation of a senseless path forward, driven by greed, profit, and the demand for cheap hamburgers. Please view our chart "Yellowstone Buffalo Slaughter Totals" which documents buffalo kill numbers from 1985 to today (chart is updated regularly). It is because of your help, and the support of people just like you, that BFC is able to reduce these numbers even as we work to obtain permanent protection for this hulking, hairy, national treasure. Will you help stop this slaughter? 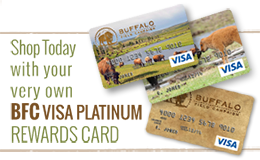 Will you make a donation defend the buffalo today?